In some instances it can be convenient to have a vacuum setup in the glovebox. This setup is for the evaporation of small amounts of solvents only, and by no means an invitation to perform prep-scale reactions inside the glovebox. It can be used to dry crystals obtained during a crystallization attempt or samples for element analysis. two types of connectors that allow you pump down the contents of aspirin tubes or scintillation vials (figure 1b). Using vacuum in the box is very straightforward. You switch on the pump, attach your flask to the vacuum, open the main valve (the black valve in Figure 1a) and start pumping down your mixture. Once finished, it is important to close the main valve again and to switch off the vacuum pump. In order to pump down an aspirin tube, you can use the adapter which is depicted on the left in figure 1b. 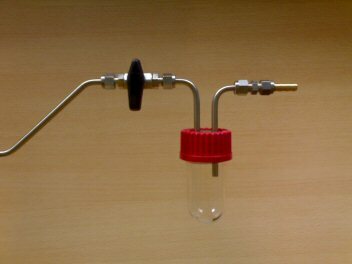 It consists of a B24 cap with a B24 hose adapter and the two together fit an aspirine tube. 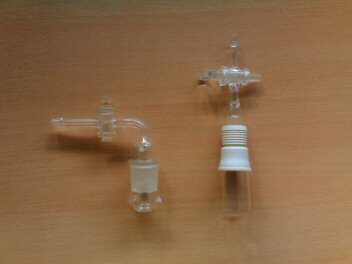 For scintillation vials you can use a B14 hose adapter with a pierced septum attached. The end of the septum has the same size as a scintillation vial (depicted on the right in figure 1b). Keep the setup clean. If you bump solvents or the setup is no longer clean, take out the setup, clean it and put it in the oven next to the glovebox. After one hour bring it back in.